ALL MINNESOTANS WITH GENIUS BUSINESS IDEAS WELCOME! MINNEAPOLIS — MARCH 20, 2017—Wondering if you have what it takes to create the next game-changing business venture in Minnesota? 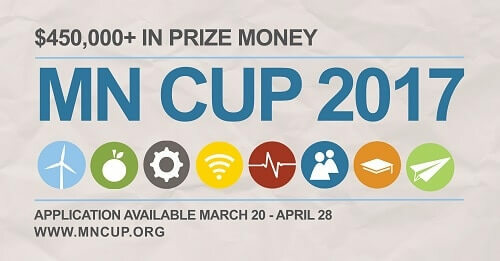 Drop by the MN Cup launch party March 20 in Saint Anthony Main’s Minneapolis Event Center to ask questions, meet past winners, and get a better feel for how MN Cup could help launch your dream — with $450,000 in total prizes! The launch party itself is a collaborative effort with the third annual Entrepreneurs at the Table (EAT) event, and will feature food and beverage samples from area startups. EAT is a showcase of local food and beverage companies hosted by Grow North, a program of the Holmes Center for Entrepreneurship that supports Minnesota’s food and agriculture entrepreneurs as they grow and scale their businesses.